What a gorgeous new release by Laborie. It’s their first Rosé wine which is presented in a beautifully shaped bottle. Inspired by the wine style of Provence it certainly does exude elegance and the price? Only R95! Laborie Rosé is a blend of Shiraz, Mourvèdre, and Cinsault, made unique by the additional touch of Cabernet Sauvignon, further captures the attention with its modern, sleek bottle. Laborie winemaker, Kobus van der Merwe, together with viticulturist Marco Ventrella, have the ability to source some of the finest grapes from the region which enables Kobus to produce wines that are bursting with flavour yet keeping French elegance and style. Due to a lower yield, and drier conditions during the summer period, the 2018 vintage produced wines that are bursting with flavour, yet elegant and with concentrated flavours. This Provençal style salmon pink wine shows prominent aromas of strawberries, Turkish delight and sweet melon. Hints of grapefruit, minerality and a touch of lime are carried through on the palate along with a seductively fresh and persistent finish. Kobus suggests that this wine can be enjoyed at any occasion, especially al fresco dining and will also pair well with stews and tomato-based pasta. He notes that even though this wine can be enjoyed now, it can be cellared for up to 18 months from vintage. The latter part of 2018 has also welcomed a brand-new image for Laborie, showcasing modern elegance with its new packaging and pay-off line La Grande Vie (The great life). Follow the Laborie journey on Facebook and Instagram where chef Mynhardt Joubert will also share unique recipes paired with each wine. 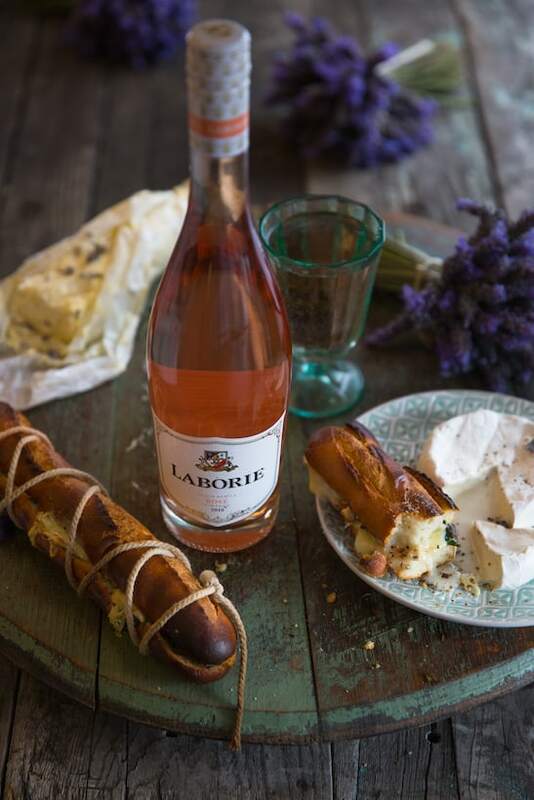 I personally tried the Laborie Rosé French Baguette and Camembert Braai sandwich with Lavnder butter for braai day and it was the perfect pairing! Here’s the recipe so you can try it for yourself. Place the cream in a mixer and whip with the whisk attachment until thick with soft peaks forming and eventually separating into fat solids and milk. Strain the liquid off through a sieve and form a ball with the butter. Make an ice bath with ice cubes and water in a large bowl, place the ball of butter inside, and massage the butter in the water until all the milk solids have come out. Cut open mini baguettes, spread with the lavender butter and top with camembert, tie up with some string, and grill on a medium to hot fire until the cheese starts to melt. The Rosé is recommended to retail at R95. Laborie wines are available online at the KWV Online Store. In the 17th century, the Tailleferts were a prosperous family in the district of La Bri, in the Poitou-Charentes area of France. After the revocation of the Edict of Nantes in 1685 this French Huguenot family boarded the Dutch East India Company’s ship Gosterland, bound for the Cape. Laborie was granted to Isaac Taillefert in 1691, which he placed in his son Jean’s name. He already owned the neighbouring Picardie. They set about clearing the bush and planting vines, which was no easy task. But within seven years they were making a drinkable wine. In fact, it was the opinion of a Frenchman, Lequat, who visited the Cape in 1698, that their wine was “the best in the colony and similar to our small wines of Champagne”. With their knowledge of French viticulture techniques, the Taillefert family laid a solid foundation of vineyards and outstanding wine production that is evident today, three hundred years later, in Laborie’s wines of distinction. Laborie offers a range of white, red, MCC’s and dessert wine.